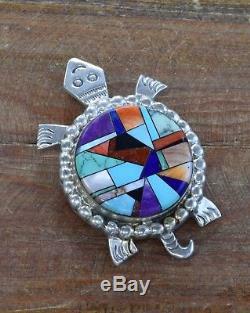 Stunning vintage Navajo sterling silver turtle pendant/pin with beautiful silver work surrounding inlaid stones like : turquoise, spiny oyster, mother of pearl, jet, lapis, coral, wild horse magnesite, sujalite, and what we believe to be dinosaur bone. 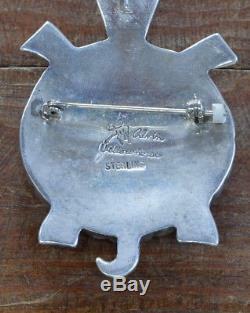 The piece measures 2 1/2" tall, and 1 9/16" wide, at the widest, but the inlay turtle shell itself is 1 1/4 around. 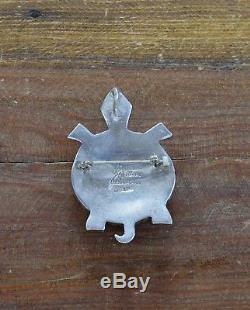 The pendant is hallmarked with a horse and says "Alvin Yellowhorse" and stamped "sterling". Lovely vintage pendant made by Alvin Yellowhorse! Feel free to ask any questions and thank you for looking! 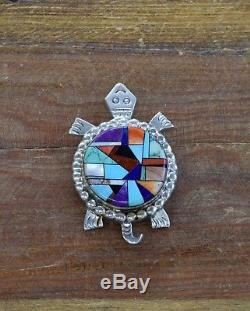 The item "Unique Vintage Navajo Sterling Silver Multi-Stone Inlay Turtle Pin/Pendant" is in sale since Friday, March 2, 2018. This item is in the category "Jewelry & Watches\Ethnic, Regional & Tribal\Native American\Necklaces & Pendants". The seller is "mrsmac3" and is located in Tucson, Arizona. This item can be shipped to United States, Canada, United Kingdom, Denmark, Romania, Slovakia, Bulgaria, Czech republic, Finland, Hungary, Latvia, Lithuania, Malta, Estonia, Australia, Greece, Portugal, Cyprus, Slovenia, Japan, China, Sweden, South Korea, Indonesia, Taiwan, Thailand, Belgium, France, Hong Kong, Ireland, Netherlands, Poland, Spain, Italy, Germany, Austria, Israel, Mexico, New Zealand, Singapore, Norway, Saudi arabia, United arab emirates, Qatar, Kuwait, Bahrain, Croatia, Malaysia, Chile, Colombia, Costa rica.